As many of you have already heard, the fire at our fields has rendered our snack bar useless. It has been red-tagged and boarded up to the dismay of the league. We have received such wonderful support from our league members and many have asked what they can do to help! *Donating to our GoFundMe campaign! Any amount helps the league stay afloat for this season! Click on the link below to access the GoFundMe page. *Donating directly to our league! We will have a Diamond Bar Pony Baseball donation box at our snack bar tables during every weekday and weekend game. *Donating a case of water, soda, Gatorade, or other individually wrapped food items that we can sell at our snack bar tables located outside of the board trailer between Fields 1 and 2. *Purchasing from our snack bar tables! As a volunteer-run, 100% non-profit organization we rely on the support and generosity of our league's membership and community! Safety and Traffic signs have been installed around the Pony Fields. There has been a few reported close calls this season with vehicles driving too fast. Please be sure to follow the speed limit and SLOW DOWN! Our Children's safety is our #1 priority and we all know they do not always look before crossing! Speed Limit inside the Pony Fields is 5 MPH! Please drive slowly to keep our kids SAFE. They will be everywhere. It will also keep the dust down. Traffic is ONE Direction. Keep to the right when entering the Fields. It loops around the Fields and comes back out. If you see someone driving too fast, please help us to remind the driver of our speed limit! There are TWO "STOP" signs at the fields. Please follow traffic laws. At approximately 3:15 a.m. on Monday, a fire was started in the portalble restroom located behind the snack bar closest to Field 3. Unfortunately, the fire was not contained and spread to our league's snack bar causing considerable damage to the wall and roof of the structure. The league is in the process of filing a claim with the insurance comapny and obtaining estimates for the repairs needed to bring our snack bar back up to code. The league is also considering stating a a GoFundMe page to help raise funds to offset any costs not covered by the insurance - details regarding this will be forwarded once a decision is made. The City of Diamond Bar has "red-tagged" the snack bar, indicating that the structure is unsafe to be occupied. At this time, we ask all league families to exercise caution and avoid entering the snack bar area. The snack bar will be closed for the remainder of this week and will open on Saturday, March 23rd, in a limited capacity. 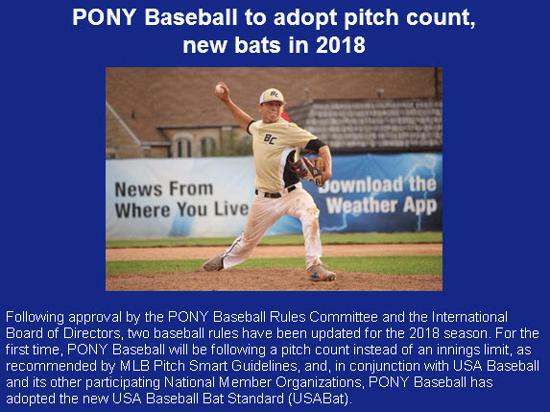 Diamond Bar PONY Baseball is a completely self-funded non profit, relying on the generosity of its members and neighbors to keep our league running. Any support that you are able to provide to us as we rebuild the snack bar will be greatly appreciated. Dear Diamond Bar PONY Baseball families. Picture day was originally scheduled for Sunday, March 3rd. However, due to the weather, the event was rescheduled to Sunday, March 24th. Please see below for your team's appointment time. Please arrive 15 to 20 minutes prior to your appointment time. Player Evaluations for the 2019 Spring Season are now complete. On Monday and Tuesday, teams will be formed and your child's team coach will contact you by Thursday evening. If you do not hear from your team coach by then, please send an email to diamondbarpony@gmail.com. Please include your child's name and division. Registration is now closed. If you wish you place your child on a waiting list, please email the league at diamondbarpony@gmail.com. We will do our best to place your child with a team for the fall season - however, we cannot guarantee a roster spot for your child. $50 Snack Bar/Field Maintenance fees will be refunded back after the snack bar shift has been completed. The Registration "REAL BASEBALL..REAL FUN!! FOR KIDS 3 1/2 to 14 YRS" is not currently available. Please send an email to melmoran222@gmail.com for Snack Shack info. Visit our Sponsorship page to see who is supporting our Teams! Visit us on Facebook @DiamondBarPonyBaseball!